Holy cow, Batman, someone bought our Batmobile. Find out how much this American TV series icon went for on the Barrett-Jackson auction block. “Holy Batmobile, Batman, someone paid $4,260,000 for our car!” Robin could have told Batman. In 1955, the Lincoln division of Ford Motor Company designed a concept car called the Lincoln Futura. This The 19-foot long, two-seat, bubble-topped grand touring car prototype was built by hand in Turin, Italy for the lump sum of $250,000. If the car never made it to production, somewhere in the mid 1960s George Barris of Barris Kustom City acquired the car for $1 directly from Ford. With 15 days to design the Batmobile and a small $15,000 budget, Barris transformed it. 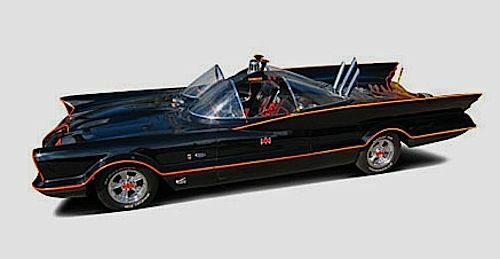 The car later became an icon eternally etched in the minds of TV viewers with the 1965 Batman TV series. KAPOW, There’s A Hole In My Wallet! No doubt about it, provenance fetches high prices these days with $4,248,500 above estimates for the Batmobile. According to the 42nd annual Barrett-Jackson auction in Scottsdale, the 1966 Batmobile set the world record for the highest price ever fetched for a TV/Movie car ever. In fact, the previous record was Sean Connery’s "Goldfinger" Aston Martin DB5 which took in $4,608,500 in 2010. Essentially, the Batmobile beat it a mere $11,500. Technically Speaking. One of the reasons why the Batmobile fetched so much is that it still sports the original 1965 Ford Galaxy engine along with its B&M Hydro Automatic transmission. As far as the famous gadgets, the nose-mounted aluminum Cable Cutter Blade is still there, as well as the “Bat Ray Projector”, the Anti-Theft Device, and of course the Detect-a-scope, Batscope, Remote Batcomputer and Batphone, the Police Band Cut-In Switch, Bat Eye Switch, Antenna Activator, Automatic Tire Inflation Device, Emergency Bat Turn Lever, Anti-Fire Activator, Bat Smoke, and it wouldn’t complete without the Bat Photoscope. What about the quick braking and U-turns? This was due to two rear-mounted ten-foot Deist parachutes. Other gadgets were hosted on the steering wheel, such as the push-button transmission, exterior microphones to pick up and transmit the sounds of traffic to the occupants inside, and a host of other innovative devices. Barrett-Jackson has built a strong reputation auctioning American iron blocks favored by a sentimental Baby Boomer generation and the Batmobile fetching an astonishing $4.260,000 million is yet another testament at how well the auction company represents this era. You need to check the math in this story.... $4,608,500 for the DB5 is not $11,500 less than $4,260,000. Overall, the story apparently wasn't edited or proofed; e.g., "the highest price ever fetched for a TV/Movie car ever."